Have you got a Wire Transfer payment by Google AdSense and it doesn’t show in your bank account? Read here on how to track Wire Transfer AdSense payment and how to report it to Google or bank. Google has upgraded they payment system for all the publishers in India and most part of the world and they are making payments through Wire Transfer. The Wire transfer payment method is available in most countries like the United States (US), UK and India publishers join this club too. This will definitely save your trip to the bank for cheque deposit. Not all people are well worth with the Wire Transfer payment method. I saw that several people have asked about they payment been received or not received at all on Google+ Communities. 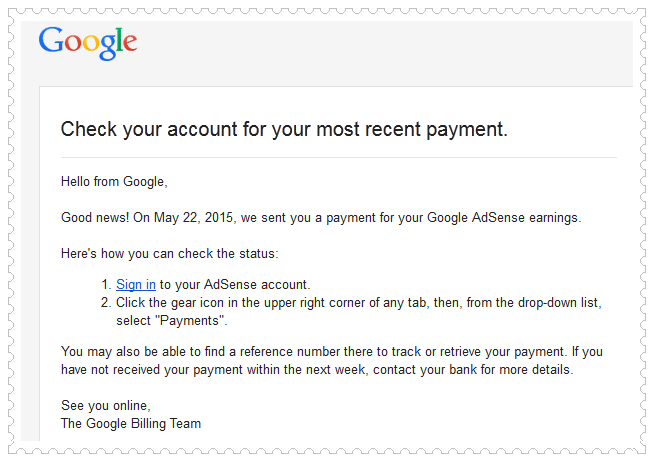 Login to your AdSense account and check whether Google sent you a payment or not. Whenever Google sends a payment, they will email you with all the details. If the payment wasn't issued, you will have to find out where the problem lies. May be you have provided wrong bank details or you haven’t reached the minimum payout. And even it’s possible that you haven’t setup Wire Transfer payment. Publishers can also check whether the payment was issued or not by going through Payment History by logging into AdSense Dashboard. If everything is perfect you are bound to receive the payment within 5 working days [count bank holidays both in India and Singapore]. Payments are handled at Google Asia Pacific Pte. Ltd in Singapore branch. For some banks, money is deposited within 2-3 days but with some local banks it may take up to one week of time as intermediary banks are involved in a wire transfer to your respective bank. In our case, the payment is sent on 22nd every month and I get it deposited in my bank account 26 or 27 dates, so that’s within 4-5 days. Note: There is actually no tracking of Wire Transfer payment available. Just wait and re-issue is the thing that you can do. And finally, we suggest you not to go with re-issue of Wire Transfer payment. Wait atleast two weeks [For new publishers it may take three weeks to get paid] and then take a call. It’s better to enable SMS alert on your bank account to instantaneously get notified of debit/credit alerts.